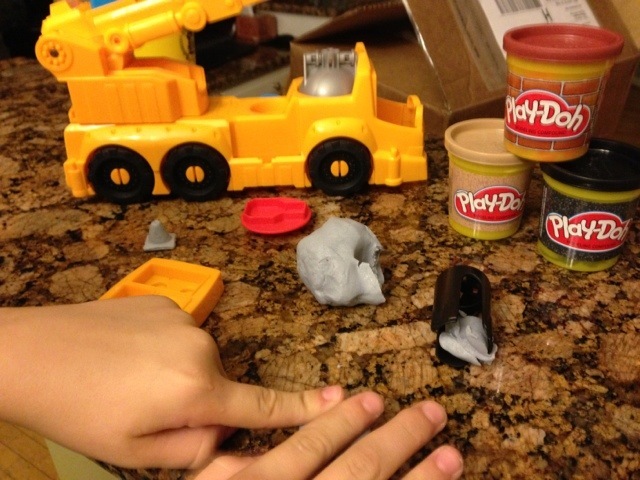 Play-Doh is seriously one of those universal toys. It’s fun for almost all ages and allows for so many possibilities and hours of play. This past weekend, along with Colleen from Classy Mommy, I co-hosted Mom Mixer, a social media event for brands and Moms to come together. The room was filled with Play-Doh toys. I’ll talk more on a lot of the toys this week I’m sure but as I sit here typing, Nate (almost 9!) is going on playing with Diggin’ Rigs Buster the Crane for almost two hours now. Play-Doh has a whole line of Diggin’ Rigs Construction vehicles that are great for boys! The one pictured below that Nate is playing with is Play-Doh’s Diggin’ Rigs Buster the Power Crane. Â It retails for $21.99, visit the Play-Doh site to see where you can buy it online. Play Doh is a toy with longevity – everyone loves it – even adults. So fun to see our kids inspired to create. Whitney- you sure got that right when you discribe Play Doh as universal and classic. .Been around since the mid ’50’s, i think,. My children, now grown, played with it, . . hey,I played with it when young! (and that’s a very long tme ago. .LOL). . alwyas, always a favorite with kids -will never go out of style, that’s for sure! describe- not discribe. . i do NOT like misspelled words. . .LOL! The Play-doh room at the event was amazing. I’m sorry I didn’t take a closer look (was enjoying my kid-free outing) because those construction vehicles sound so cool. I am definitely going to keep an eye out for them!